A giant portrait of President Barack Obama has been unveiled in New York City. This is not just any portrait. 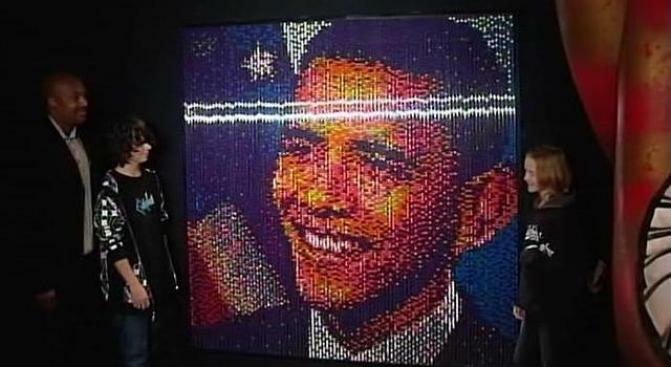 It is made out of gumballs -- 12,784 of them, to be precise -- in eight different colors. It took a group of school kids from Ohio some five hours to put the portrait together. The Obama gumball art will be part of a permanent exhibit of presidential artifacts in Ripley's Believe It or Not! in Times Square, located at 234 W. 42nd Street in Manhattan. It joins other pieces like one of Abraham Lincoln made out of Lincoln pennies. And, presidential locks of hair from John Kennedy, George Washington and Lincoln.